Throughout 2018 I’ve been working on a collaborative project about interactive media and technology and public engagement with climate change. An artwork that has resulted from this collaboration – here and now – was shown as part of the Great Exhibition of the North during the summer. There will be another opportunity to see here and now at the Great North Museum: Hancock on the evening of 28th September, as part of their European Researcher’s Night that has the theme of Planet 2.0. Admission is free so, come along to see our work and many other interesting projects. This entry was posted in Computing, Design, News, Research, Technology, Web and tagged #EuropeanResearchersNight on September 13, 2018 by sjbowen. This is an interactive artwork I made with Tim Shaw and was one of the several pieces that resulted from the Sound Spaces project with John Bowers and Stefan Kazassoglou. Sound Spaces was an investigation, through making, of various intriguing locations across Liverpool in 2015. One of the places we visited was Liverpool’s Old Dock, which is largely unseen to passersby being underground in the foundations of the Liverpool ONE leisure and retail development. Anyone can visit The Old Dock by booking onto one of the free guided tours offered by National Museums Liverpool, but I wondered whether 360-degree spherical photographs, layered with images and sounds evoking the site’s past and present, could engage passersby above ground. I worked with Tim Shaw to create a first prototype, which attracted sponsorship from Liverpool ONE to develop and install the piece for two years. The artwork went live in April 2017, some of the first visitors being a convention of Lord Mayors! The piece is intended to be viewed on location in Liverpool ONE. But the image below gives a flavour of it. This entry was posted in Design, News, Photography, Research, Web on April 14, 2017 by sjbowen. But the Winchester Mystery House has many more layers than this. It is an architectural pattern book of Victorian style. It is a monument to the many labours and crafts that produced it. It is an antidote to rigid design and ‘logical’ buildings (although Sarah Winchester applied different logics in its construction). It is the satisfaction of a previously frustrated architect’s desire to build. 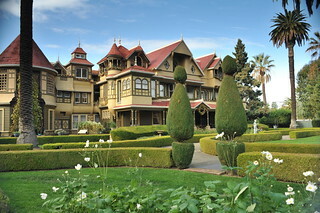 It is a physical manifestation of Sarah Winchester’s psyche and how she sought to deal with the tragic deaths of her infant daughter, husband and others close to her. And it is an attempt to make this conundrum engaging to modern visitors through ascribing mystery and intrigue, and the answers we append to all those ellipses. What is so fascinating, though, is that the house is all these layers and others all at once. And is no different to anywhere else in this respect, simply a vivid example of this layering. I loved it. Unfortunately photography inside the house is not allowed, but I took several outside. This entry was posted in Photography, Research on November 12, 2015 by sjbowen. We intend to develop these works further for a public installation towards the end of October. This entry was posted in Design, Photography, Research on August 28, 2015 by sjbowen. The site has a rich history including being one of the oldest Norman churches in the country (founded in 1069). But whilst I was there I learned that the building has hosted notable events more recently being the venue for Taiwanese superstar and ‘New King of Asian Pop’ Jay Chou’s wedding. This entry was posted in Photography, Research and tagged panorama, panoramic on June 12, 2015 by sjbowen. After much of my usual prevarication I’ve finally created a book of 21 of my panoramic photographs of Yorkshire. I’ve used BobBooks rather than iPhoto. We normally use Apple’s iPhoto for our annual books of family photos because the layouts are easy to populate and elegantly designed. However I wanted lay-flat pages for wide panoramic images spread over two pages (that is when you can open the book and not get the image squeezed in and out of the spine at the fold line). BobBooks offer this and printing on photographic lustre paper, which yields better contrast and deeper colours than traditional printing. The layout tools provided are a little clunky (compared to intuitive iPhoto), but worth persevering with to get the image quality. I wrote the introduction and captions to the book for an interested audience, rather than just the family so that I could offer the book for sale, too (no profit taken – these books are expensive enough as it is). You can check it out here. This entry was posted in News, Photography on March 23, 2015 by sjbowen. I was at a Skills in Action event in Edinburgh a couple of weeks ago delivering a workshop on academic-industry collaborations with my Lancaster colleague, Naomi Jacobs. Whilst there we were there, Times Higher Education spoke to us about the creative and cultural industry collaborations we have been involved in. Read the full article here. This entry was posted in Design, News, Research on November 28, 2014 by sjbowen. Better Services By Design: Introduction from User-centred Healthcare Design on Vimeo. This entry was posted in Design, Research on October 3, 2014 by sjbowen. I’m presenting at the Design Research Society (DRS) conference in Umeå, Sweden. Discussing a quandary of research through design – as a designer-researcher, how can I capture the how/why of my designing (for research into design methods) without interfering with the designing itself. This entry was posted in Design, Research on June 17, 2014 by sjbowen.